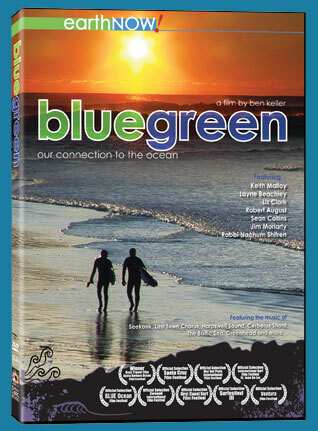 The DVD release of BlueGreen not only has the film, subtitled in French, Spanish and English, but also a host of extras. There are extended interviews with KEith Malloy, Jim Moriarty and Rabbi Nachum Shifren. There is a special piece on surfing in the Northeast. And! If that wasn't enough the DVD also contains the soundtrack as DVD-ROM content! So not only does the DVD contain an amazing investigation of our incredibly important connection to the ocean, accompanied by moving imagery, stories and an fantastic soundtrack, but you get all this other cool stuff as well. The Trailer and lots of other really great information, including some amazing reviews, are available here on the site. Explore your ocean bonds with BlueGreen! What is it about the ocean that pulls at us? There are obvious reasons, weather, livelihood, the fact that it's such a dominating presence on our planet. But there is something deeper. Songwriters, poets and novelists have expounded upon this mystery for as long as there has been harp and printed word. But what do we really know about our deeper human connection with the Ocean? BlueGreen attempts to answer this question by sitting down with 13 folks who have been lucky enough, passionate enough, dedicated enough or some combination of these to look deeper into our bearing with the ocean as humans. These folks vary, from scientists to activists, athletes to enthusiasts, religious types to technological types. But they all have one thing in common. The ocean is the touchstone of their existence, and this being so, they can perhaps better elucidate on why all of us are attracted to it in one way or another. These folks recognize the power of the ocean, and how it affects their lives and the lives of others. They recognize the threats we face by disconnecting and abusing this powerful source of life on our planet, and what we need to do to mitigate some of the issues we face with the ocean. And where better to look for these folks than in the rolling frothing surf at the water's edge, where ocean enthusiasts congregate to better their lives by connecting to the ocean. Here BlueGreen finds it's 13 subjects. Through these people, their profiles and stories: watermen, athletes, spiritual leaders, technological leaders, activists, fishermen all, BlueGreen leads one through a journey of discovery and wonder.